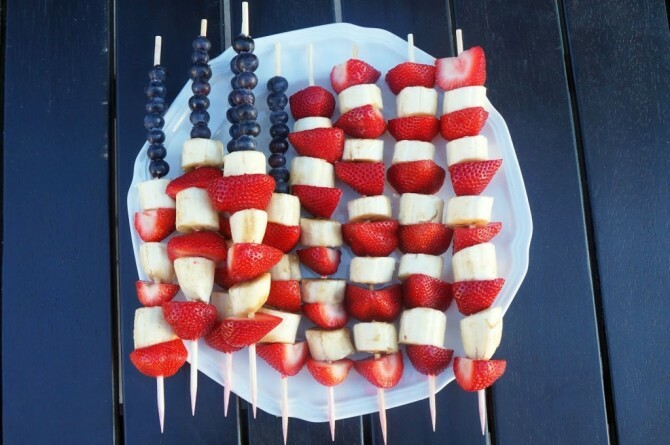 The 4th of July isn't complete without a flag dessert. Independence Day may be the holiday with the most fruit desserts. When you walk into a bakery in July every single cake is covered with blueberries, raspberries and strawberries, and every cookie bears the American flag artistically produced in icing. Instead of duplicating something your friend might bring to the party from your local bakery, why not whip out the berries and make this gorgeous flag dessert. 2. Slice strawberries in half. 3. Skewer strawberries and bananas. 4. Slide blueberries onto a third of the skewer and follow with bananas and strawberries on the same stick. 5. Arrange skewers into respective pattern.